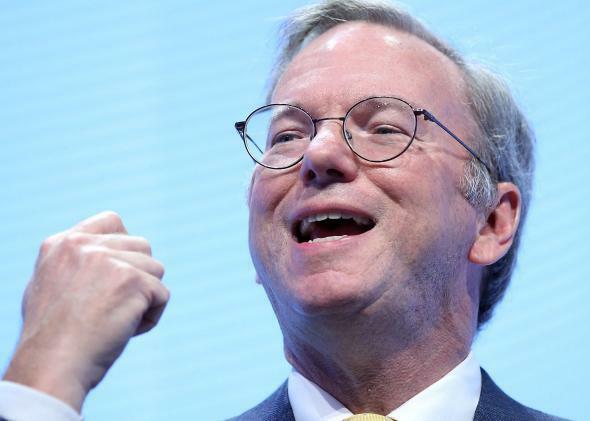 Google's Eric Schmidt: "We win" even when economy suffers. Bloomberg TV scored what it bills as “a rare interview” with Google chairman Eric Schmidt, in which the would-be soothsayer lays out his tech predictions for the year to come. Go out on a limb, he does not. Mobile, you say? Wow, didn’t see that coming. Big data? Social? OK, now you’re just rattling off buzzwords from 2011. But hey, I think you forgot “hyperlocal,” didn’t you? In Schmidt’s defense, he has made bolder predictions in past years—and, as The Verge’s Tom Warren notes, they didn’t pan out so well. Predictions are hard, especially about the future. Maybe it’s not such a bad idea to stick to predicting things that have already happened. That might sound obvious, but careful observers will note it’s a different (and more honest) line than Google used to take when it came to disruption of traditional industries. I’m biased here, obviously, but I’ll never forget Marissa Mayer sitting in front of a roomful of print journalists and assuring them that Google had a stake in seeing them prosper. That was right around the time they all started losing their jobs. That probably wasn’t what Schmidt had in mind here—he’s talking more about how other types of traditional industries still have an interest in advertising on Google even when money’s tight. But the deeper truth here is that Google’s financial interests are not necessarily aligned with the health of the economy at large. Google does many wonderful things, and the world is better off for its existence, but no one should be under the illusion at this point that it’s an entirely beneficent force in the marketplace. Rather, it’s in the business of creative destruction, and the hope is that it ultimately creates more than it destroys. Our Data Is Worth Billions to Facebook and Google. Should We Really Be Giving It to Them for Free?